When I first decided to do this Saint Patrick’s Day series, the one product I knew I wanted to include was the Crunchie candy bar. This Irish candy was one of my favorite childhood treats, and I couldn’t wait to create a grown up dessert with it. I picked up a few last week along with some Flake bars, another favorite of mine, and got to work. What I came up with is a new cupcake that takes these candy bars to a whole new level. To give you some info on a Crunchie, it is a milk chocolate candy bar with a honeycombed center. It’s pretty light and has a nice caramel flavor to it. I wanted the flavor of the candy to shine, so I decided to crush up some candy bars and add them to my go to vanilla cupcakes. To enhance the caramel flavor of the candy bar, I picked up some caramel flavored Baileys to add to the cupcake batter too. You had to know by this point that some type of liquor would be making an appearance! The cupcakes were looking good at this point, but I needed to figure out how to incorporate the Flake bars. While also a milk chocolate bar, a Flake is layers upon layers of very thin chocolate which creates a very delicate candy. I really thought I would just be using them for a garnish, but then it hit me to make a ganache with them. Using the flake bars to make a ganache worked out great, and that little chocolate filling was just what the cupcakes needed. To finish off the cupcakes I made some whipped cream spiked with some more caramel flavored Baileys. The whipped cream was the perfect topping, light & not overly sweet. 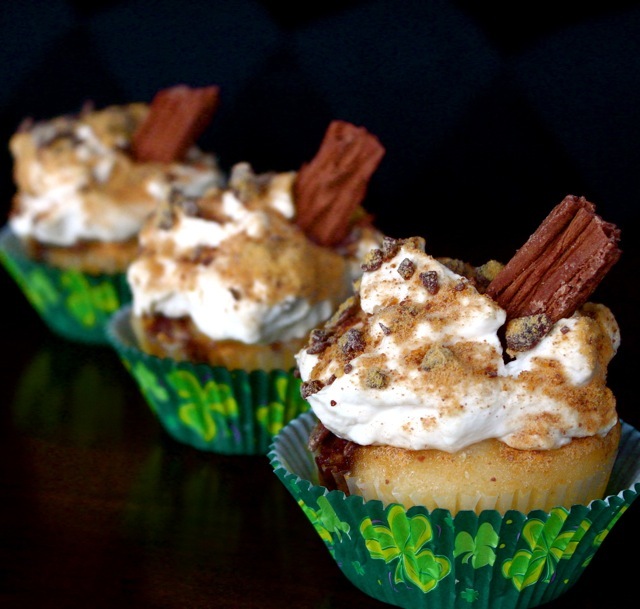 Garnished with some more candy, these cupcakes are a fantastic treat for any Saint Patrick’s Day celebration. I hope these cupcakes along with the rest of the desserts in this series help you to think “outside the glass” this weekend! It was a lot of fun getting to share some of my favorite Irish goods with you, and I hope you guys enjoyed the series as much as I did! I also want to thank Raycom News and Joseph Neese for featuring me in a Saint Patrick’s Day story today. If you would like to check it out, you can do so here. Have a great weekend and Happy Saint Patrick’s Day! Use your favorite vanilla cupcake recipe. Once you fill the cupcake pan, break up a candy bar into small pieces, and drop them on top of the batter. The pieces will sink in a little, but not much. After the cupcakes have baked and completely cooled, freeze them. Freezing them makes it easier to scoop out the centers when you’re ready to fill them. *Please note the amounts for the ganache and whipped cream frosting are for a batch of 12 cupcakes. Bring heavy cream to a low boil. Pour over chopped candy and stir to combine. Whip heavy cream in mixer till it starts to get frothy. Add sugar and Baileys and continue to whip until peaks form. Scoop centers out of frozen cupcakes. Spoon a small amount of ganache in the cupcakes. Top with a generous spoon of Baileys whipped cream. Garnish with chopped candy bar pieces.